Using Automotive Wolf to manage your car maintenance schedule keeps you informed of what is going on with your automobile. Information is power! The power to save yourself from unnecessary expensive car repairs and keep your vehicle in a safe operating condition. Creating and configuring your vehicle only takes a few minutes of your time. Then you can relax knowing your vehicle is being monitored and you will be notified when any service is due. Easy and amazingly effective! Are you a Car Fanatic ? If you are a serious automotive enthusiast and really into keeping your car, truck or motorcycle in tip top shape then Automotive Wolf is the perfect solution. You can configure each maintenance plan to exactly match your manufacturers recommendations. You can Right Click on each maintenance requirement and modify it to suit your personal preferences or the specifications in your owners manual. Each vehicle you own can be configured exactly as you like including creating your own maintenance requirements that you think are important. Configure each requirement to be due by Date, Mileage or both and specify the maintenance intervals. Once configured all the requirements will be automatically rescheduled for you when completed and you will be sent a reminder when anything is again due. Automotive Wolf will keep a professional detailed maintenance and repair log for each vehicle you own including automatically compiling a detailed parts list as you add maintenance records. Scan and attach work orders and receipts to each maintenance record. Track your fuel usage to monitor your cars fuel economy MPG. Average family car owner rejoice! We make it easy to keep your vehicle in great condition and keep it safe to drive! You can create and configure your car maintenance schedule in seconds. Then just sit back and wait for reminders when any car service is due. When you see a reminder simply click on the What's Due List and print out a Scheduled Maintenance Report that lists everything your mechanic should check. Then satisfy the requirement in Automotive Wolf with a few clicks and everything is automatically rescheduled for you. 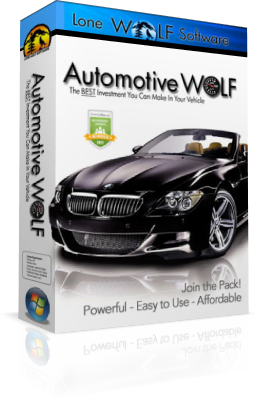 After you have installed Automotive Wolf simply click on the Create button to create your first vehicle in the database. During the process you are asked to select a maintenance plan (high, medium, low, do it yourself). The maintenance schedule you select is generic and easily modified after the vehicle is created. Since every Automotive manufacturer has specific maintenance requirements for each of it's vehicles it's a good idea to go through your vehicles maintenance schedule in your owners Manual and make sure it matches the schedule in Automotive Wolf. Make any adjustments as needed and you are ready to go! Automotive Wolf constantly analyzes your driving habits to be able to predict maintenance issues in the future. So even if you neglect to use the software for a while, it can notify you every time you boot-up your computer and automatically send you email reminders of upcoming required car maintenance. When you complete a maintenance requirement that is due make sure to satisfy it in Automotive Wolf by adding a maintenance record with an accurate odometer and Date. This resets the "predicted odometer" to allow Automotive Wolf to become more and more precise in its prediction algorithm. It is a good idea to occasionally add a few Fuel records so Automotive Wolf can check your fuel economy (MPG). This can be an excellent indicator of your vehicles overall health. The most accurate results are obtained when you add a Fuel record between two Fill-ups. So Fill-up your car and jot down the odometer. Then drive your vehicle normally until the next Fill-up. Record the odometer and number of gallons used and enter a Fuel record using this data. This will yield an accurate MPG for your vehicle and a data point on the Vehicle Fuel economy graph. Over time you can watch the MPG trend on the graph and quickly see if your vehicle is maintaining or declining in its performance. To see the Fuel Economy results simply click on the FUEL TAB in Automotive Wolf and then select the Fuel Economy Graph option to see a detailed graphical representation of your vehicles fuel economy history, MPG vs Time. Automotive Wolf tracks and records all the costs associated with owning your vehicle so enter accurate values when you add maintenance or repair records including other expenses like Insurance, loan payments etc. After creating your vehicle click on the EDIT button to enter specific vehicle cost information including purchase price, monthly payments and loan duration. This will allow Automotive Wolf to accurately calculate exactly what your vehicle is costing you to own daily, monthly, yearly or to drive on a cost per mile basis. If you own several vehicles this can be quite illuminating so you'll know which vehicles are straining your check book! Watch that Vehicle Health gauge! Automotive Wolf's Vehicle Health Gauge is a great way to quickly see your current vehicles overall condition. It measures its condition by analyzing the state of all the enabled maintenance requirements for your vehicle. It's final result yields an accurate representation of its current health. If you see the gauge beginning to trend into the POOR range check the What's Due List to see the maintenance requirements that are Due. You can hover your mouse over the Vehicle Status Gauge button located directly over the Health gauge to see a itemized list of each maintenance requirements effect on the gauges final result. Automotive Wolf tracks and monitors all the enabled maintenance requirements for each of your vehicles but if you have something you really want to keep a close eye on simply enable a real functional gauge for it! It's easy! Just Right Click on a maintenance requirement in the What's Due List and select the gauge option or click on the Gauge Button located below the What's Due list to quickly enable gauges for any requirement. The gauges accurately show the status of any maintenance requirement. Saves you money! : Helps you avoid costly repairs and the "downtime" required when your vehicle needs repairs. Warranty Compliance: To comply with your manufacturers maintenance schedule required by your warranty and be able to prove it! Maximizes Resale Value: Good maintenance records maximize the resale value of your vehicle. Extends Vehicle Life: Simply staying Up-to-Date on your car maintenance will increase the life of your vehicle and minimize the "headaches" involved with constant repairs. Improved Reliability: Tracking your vehicle maintenance allows you to schedule reminders when service is due. This results in a better running vehicle and greater reliability. Scam Avoidance: Helps you to avoid common scams, unnecessary maintenance and overpriced dealer service plans from some service shops. Cost Awareness and Comparison: Keeping a detailed maintenance and repair history for each vehicle you own allows Automotive Wolf to provide an in-depth analysis of your Operating Costs. You can compare what it costs you to drive and maintain each vehicle you own. Increased Knowledge: The knowledge you gain from being aware of your cars maintenance requirements will ultimately save you money! Maintain it like a "PRO": You don't need to be an ASE certified mechanic to keep your car in great running condition. Simply follow Automotive Wolf's advice and recommendations and you will be able to maintain any vehicle like a PRO. Ease of Use : Automotive Wolf's gauges let you monitor the overall status of your vehicle at a glance. 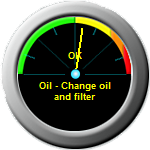 Create a gauge to monitor any maintenance requirement and let it remind you when maintenance is due. "...money spent on vehicle maintenance is not always spent wisely. Much of this confusion and neglect can be attributed to a lack of specific knowledge about what the car manufacturer recommends in the service schedule included in the owner’s manual. To make matters worse, some service shops have their own set of service guidelines that call for more frequent service than is recommended by the manufacturer. " Keeping your vehicle in good condition to avoid breakdowns and problems simply requires that you stay up-to-date on scheduled maintenance. Use your manufacturers recommended maintenance schedule in your owners manual ! If you do not have the owners manual you can usually find it online at the manufacturers website or from your dealership. Then setup a maintenance schedule in Automotive Wolf using the manufacturers maintenance specifications. This usually only takes 10-15 minutes to complete. Go thru each manufacturer requirement and find the matching maintenance requirement in Automotive Wolf and set it to be DUE when the manufacturer specifies it should be checked next. Then set the period due between checks (ex: 3000 miles for oil changes) and you will automatically be reminded every time it's due for the life of your vehicle! If any of the manufacturer inspections or required maintenance is not already included in Automotive Wolf's requirement set simply create your own ( it's easy ). Each vehicle in Automotive Wolf can have it's own vehicle specific set of maintenance and inspection requirements. You can edit or disable any of the "built-in" requirements or create your own as needed to match the manufacturers recommended schedule. Copyright © 2017 Lone Wolf Software, All rights reserved.